Analyze2RealizePro is an “industry specific, prebuilt Business Intelligence solution”, developed by Business Analytics Consulting Group, to assist the Small & Medium Enterprises exploit the power of BI for their sustained growth in the long term. It is practically unaffordable for SME’s to make a significant financial investment in technology and specialized resources required to harness the power of BI technology for their business. This was a compelling reason for us to develop an innovative out of the box Analytical Solution that we named as “Analyze2RealizePro”. Are you an owner or manager of a Small or Medium Enterprise (SME)? If you answered “Yes” to any of the questions below, then “Analyze2RealizePro” is meant for you. Do you find it challenging to achieve your business objectives due to lack of qualitative and timely information? Are you unable to monitor business performance and make informed strategic and tactical decisions? Are you concerned about growing competition, shrinking margins, and the future growth of your company? Analyze2RealizePro is the right Business Intelligence foundation for a Small and Medium Enterprise, that enables stakeholders to optimize business operations, increase revenues, prevent loss, and respond quickly to customer needs and market trends. It is a complete business intelligence system in a box, built using proven and leading BI technology components, attractively priced, has flexible deployment options and ready to grow with your business. about their markets, customers, operations and finance, but most often this information resides in silos within the organization and is difficult to integrate and analyze. For this reason, the promise of getting accurate and timely business insights for making informed decisions in the operational, strategic and tactical areas, often goes unfulfilled. 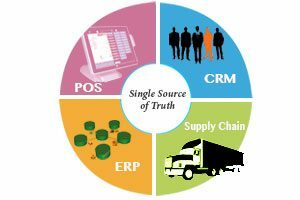 Analyze2RealizePro helps enrich your data by putting it in context with data from sources such as Point-of-Sale Systems (POS), ERP, Supply Chain and CRM applications, creating the single source of truth and providing up-to-date business intelligence across your organization. Stay informed. 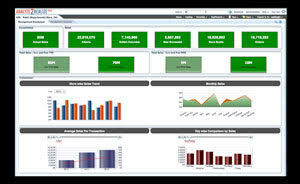 Get at a glance view of key performance indicators. Analyze2RealizePro has a fully interactive pre-built dashboard, which makes the presentation of data intuitive and easy to understand, with unrivalled ease of use characteristics. The dashboard provides at a glance view of key performance indicators (KPIs) and important metrics in a rich variety of charts, graphs, and gauges with drilling and navigation capabilities. The KPIs can be customized to show exceptions or values crossing a pre-set threshold, giving personalized, actionable intelligence for decision-makers. Unleash the power of your data. Get fast answers to critical business questions. Analyze2Realize offers a set of powerful pre-built analytical reports that empower decision making with accurate information, in summary or detail. Business users get better visibility into risks, problem areas and critical issues, so that they are identified early, allowing them to take proactive actions. The drill-down capabilities of the analysis allow users to analyze further details and identify exactly which areas of the business are doing well and which aren’t. The pre-built nature of the analytical reports shields the users from the complexity of the underlying data structures, ensures highest ease of use and lowers the workload on IT personnel. Achieve greater transparency and visibility into multiple business areas – saving you time and money in manual information processing. Want to find out how Analyze2RealizePro can help you optimize business operations, increase revenues, prevent loss, and respond quickly to customer needs and market trends? Contact us now for a demo. Previous Previous post: Can Pre-Built Analytics Help SMEs Optimize Business Performance?